This course wore me out…in a good way. I did not think it was possible to do and learn so much in only 5 days. 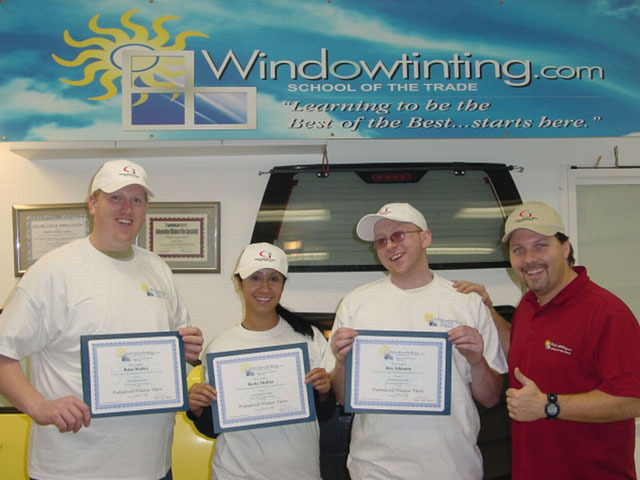 I feel very confident in my future as a window tinter. As a female I didn’t know what to expect from a hands on experience from something I never thought I’d understand. However, since day one, Robert explained things in such details that everything turned out to be a piece of cake. If I could do it again I would. Robert is an amazing teacher. It’s obvious he doesn’t do it for money, but for the passion of window tinting. I loved it. I came from London, England to complete this course. I would highly recommend any “professional”, novice or wannabe tinters to do this course, unless you’re from London, because once I get back I’ll be setting a hard act to follow! Thanks Rob. P.S. Nice lunches!